Catch Flying Creatures for Further Study. This super sturdy net makes it a breeze! 14" wooden handle is easy for younger kids to use. 26"L. Net opening is 12" diameter. Super sturdy net makes it a breeze to catch flying critters. 26" long with a 14" wooden handle that's easy for younger kids to use. In 3 assorted colors: blue, red and orange. 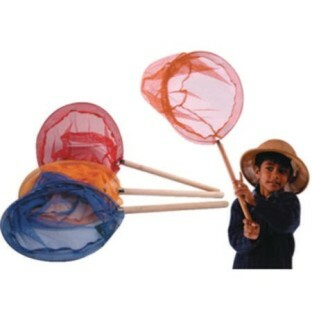 Net opening is 12" diameter. Sorry, no color choice. Children of all ages love to hunt and try to capture little creatures from flys to butterflys - then let them go again! Good large motor and thinking skills activity.